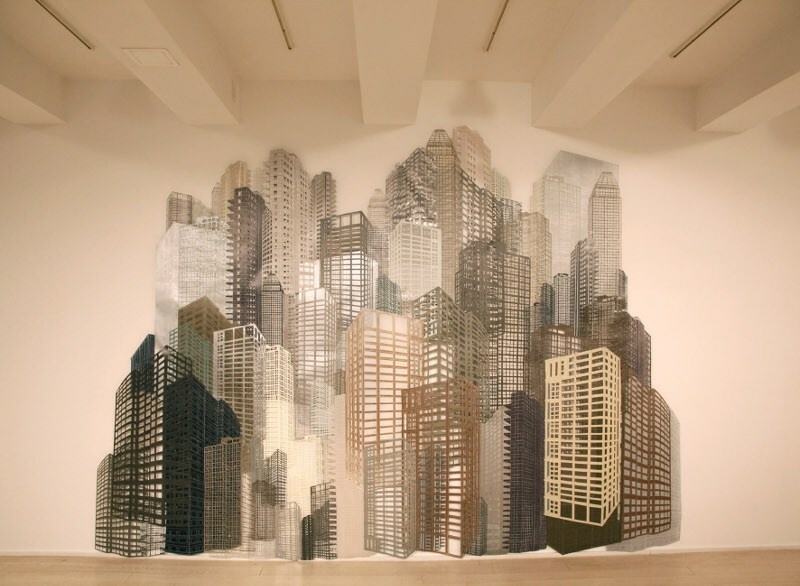 Nicola López is an American artist who works in installation, drawing and printmaking. 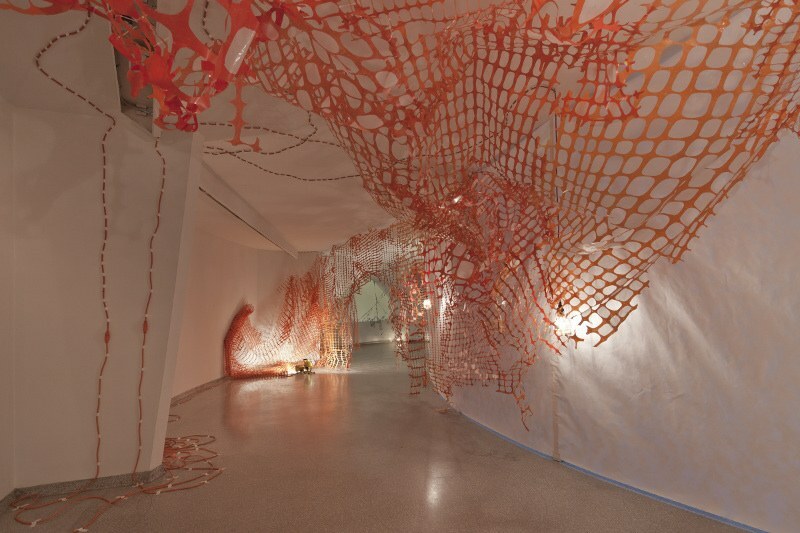 Her installation work incorporates printed elements and various other materials creating industrial environmental landscapes with objects of construction and architectural decay. Born in Santa Fe, New Mexico, Nicola received a BA in anthropology and MFA from Columbia University. She also attended Skowhegan School for Painting and Sculpture in Maine as well as the School of Visual Arts in Rio de Janeiro, Brazil. She teaches at Columbia University in New York City. Through her work in printmaking, drawing and installation, Nicola López explores our contemporary, primarily urban, landscape. Her focus on describing “place” stems from an interest in urban planning, architecture and anthropology and it has been inspired by time spent working and traveling in countries such as Mexico, Peru and Morocco. 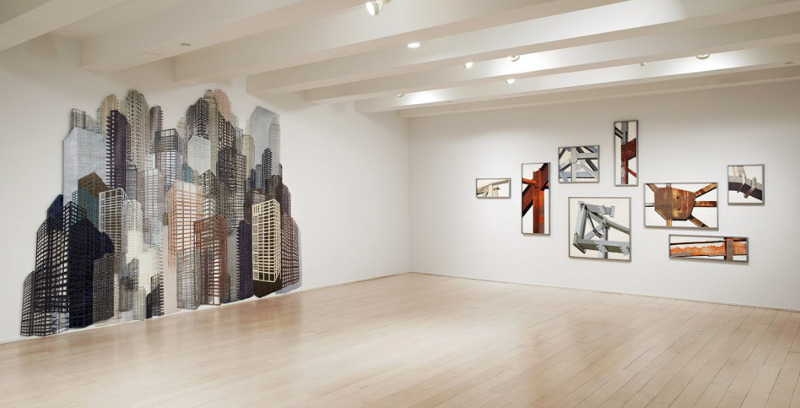 López builds her work by layering image upon image, often drawing upon cartography and using printmaking, collage, drawing, and installation to create maps of her own visions of urban cityscapes. Abandoned contemporary environments appear in a state of decay, or perhaps left only partly completed. In her Monument series made in 2009, Nicola López depicts a landscape that is somewhere between present and future, but mostly defined by its past. 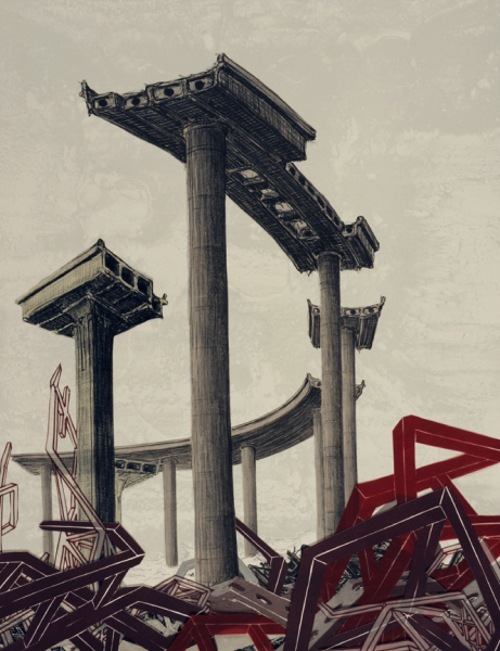 The central forms in every image from the Monument series are pieces of a bigger construction that was once whole but has now mostly fallen down, contributing to the fields of ruins out of which the Monuments rise. Although López’s collapsing built environments suggest this natural process of decay, they are still charged with potency and even grace. López’s site-specific work Un-building Things was commissioned by the Metropolitan Museum of Art for the Balcony Lounge, New York, in 2013. López created Un-Building Things using linocut and monoprinting techniques on top of mylar forms that were laser-cut from hand-drawn stencils. The elements of the piece were printed and assembled by López, in collaboration with Pace Editions’ printers, over the course of two months, then installed on-site in the Balcony Lounge by the artist. The first commission, Un-building Things is on view until mid 2016. López’s site-specific installation, Landscape X: Under Construction was made in 2011, as part of the Guggenheim’s Intervals series, designed to reflect the spirit of today’s most innovative practices. A sculptural collage environment in the museum’s Frank Lloyd Wright–designed rotunda, Landscape X: Under Construction enclose viewers in an industrial dreamscape, a reference both ethereal and literal to the world outside the museum’s doors. Using various printing and collage methods, López has created a situation where the exterior floods the interior, the grid invades the spiral, and distortion trumps order. 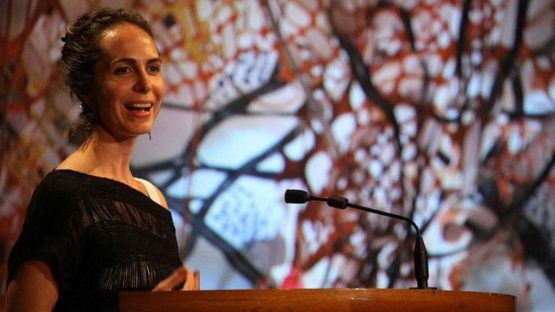 López received an MFA Graduate Award from the Joan Mitchell Foundation and support for her work through a NYFA Fellowship in Drawing/Printmaking/Book Arts, among others. She completed residencies at the Headlands Center for the Arts, Sausalito, California, La Curtiduría in Oaxaca, Mexico and the Inside-Out residency in Bejing, China. Nicola López has participated in numerous solo and group exhibitions in prestigious galleries and museums in the United States and internationally, including MoMA, New York, the Los Angeles County Museum of Art, Metropolitan Museum of Art in New York, Museo Rufino Tamayo in Mexico City, the Denver Art Museum, the Chazen Museum of Art, Madison, WI, and the Solomon R. Guggenheim Museum in New York, among others. Nicola López work is in many notable private and public collections including Chazen Museum, Madison, WI, Davison Art Center Collection at Wesleyan University, Middletown, Detroit Institute of Art, Detroit, Madison Museum of Contemporary Art, Madison, Metropolitan Museum of Art, New York, Museo Nacional de la Estampa, Mexico DF, Mexico, Museum of Modern Art, New York, and New Mexico Museum of Art, Santa Fe, to name a few. Nicola López lives and works in Brooklyn.